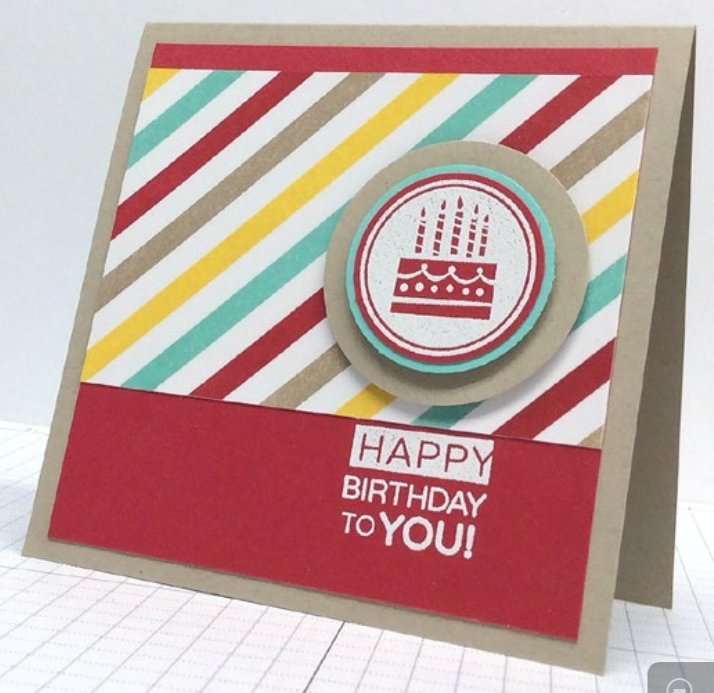 It’s my favorite time of year for Stampin’ Up!….Sale A Bration time! I regret that I am delayed in getting this information out to you, as right after the new year began I was faced with unexpected emergency surgery (I am now less on gall bladder) and some unfortunate post-surgical complications and infections which wiped me out for a few weeks. However, God is good and I’m getting back on my feet and I’m ready to jump back in to my favorite thing, paper crafting! And Sale A Bration is the PERFECT time to do that! 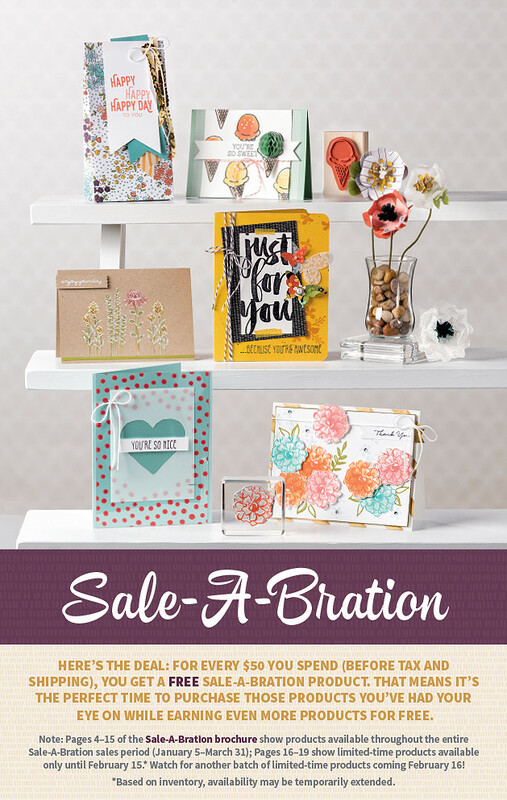 Click here to see the 2016 Sale A Bration Catalog! Sale on Paper Pumpkin PLUS a free gift- yes, really! Get a 3-month Paper Pumpkin subscription for just $55 US/$69 CAN and instantly qualify for a FREE Sale-A-Bration item? Yes, please! Now is the best time to skip to the fun with us! We’ve discounted the 3-month subscription to make it supereasy (one word) for you to qualify for Sale-A-Bration, the hottest Stampin’ Up! promotion of the year! Take it to the next level and surprise yourself every month for a year! With a 12-month prepaid subscription at the everyday awesome price, you’ll save even more! And just like that, you hit the Sale-A-Bration jackpot! Talk to your demonstrator (that would be me, Laura) to place your order, or visit the online store (US/CA). You can call or email me with your order, or chose Laura Dehnert from Lake Mills, WI under the demonstrator directory more info here. Offer ends at 11:50 PM (MT) and that’s pretty much all the fine print we have for you this time because this deal is just that awesome! Paper Pumpkin Sale Ending Soon! Get a discount and instantly qualify for a Sale-A-Bration reward? Yes, please! You have until March 31st to take advantage of this great offer- purchase a 3 month subscription to Paper Pumpkin for the sale price of $54.85 (normally $59.85, saving you $5.00) and also qualify for a FREE Sale-A-Bration product! Read about Paper Pumpkin here – you’ll get three kits with everything you need to complete a project, including stamps, ink, adhesive, and ready-to-go supplies. 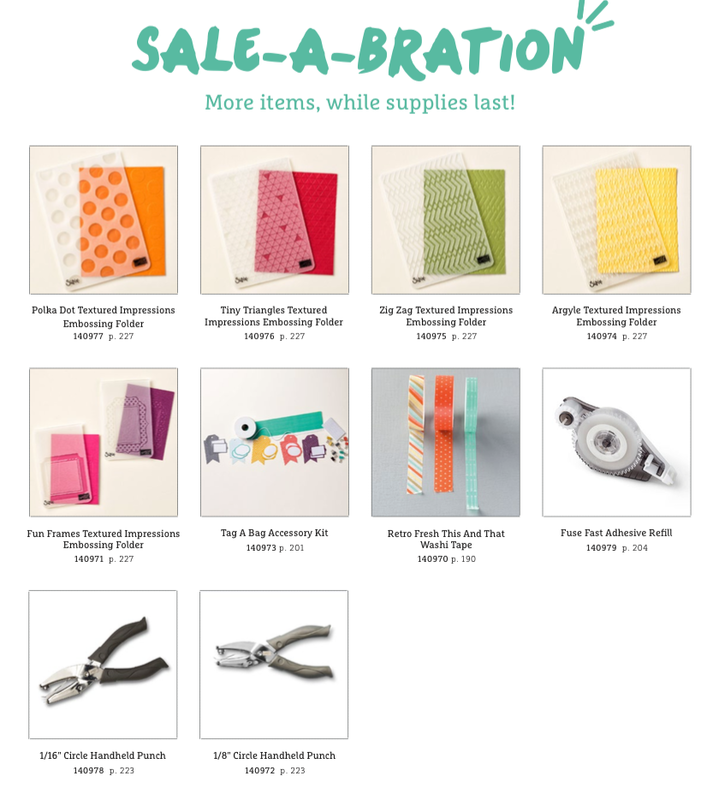 Even more NEW Sale-A-Bration Items! Since Stampin’ Up! announced that they are discontinuing the line of Blendabilites markers (more info here) that meant fewer products to choose from when earning Sale-A-Bration items. Well, there’s good news- ten more products are now available to choose from! These products, along with the other items in the Sale-A-Bration brochures (here and here) are available while supplies last through the rest of the Sale-A-Bration promotion period (March 31). For every $50 you spend (pre-tax and shipping) you get your choice of any of these items for FREE! 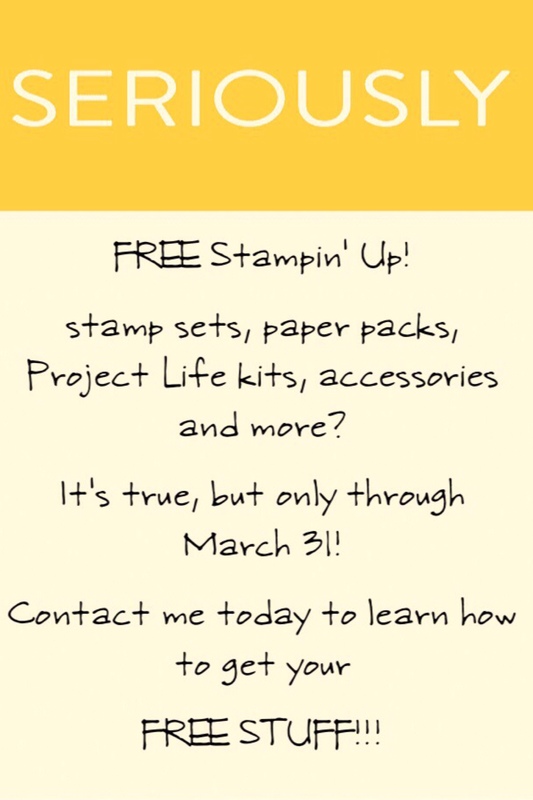 The stamp sets, paper packs, and Project Life mini kits are exclusive to SAB and are not available for purchase. Place your order before March 31st to take advantage of this great deal! Don’t hesitate to contact me with any questions. 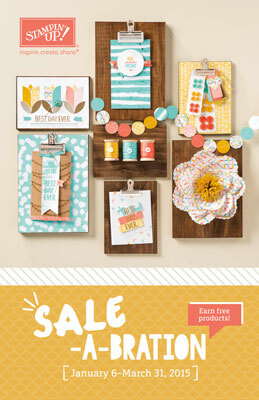 NEW Sale-A-Bration Free Products for March! 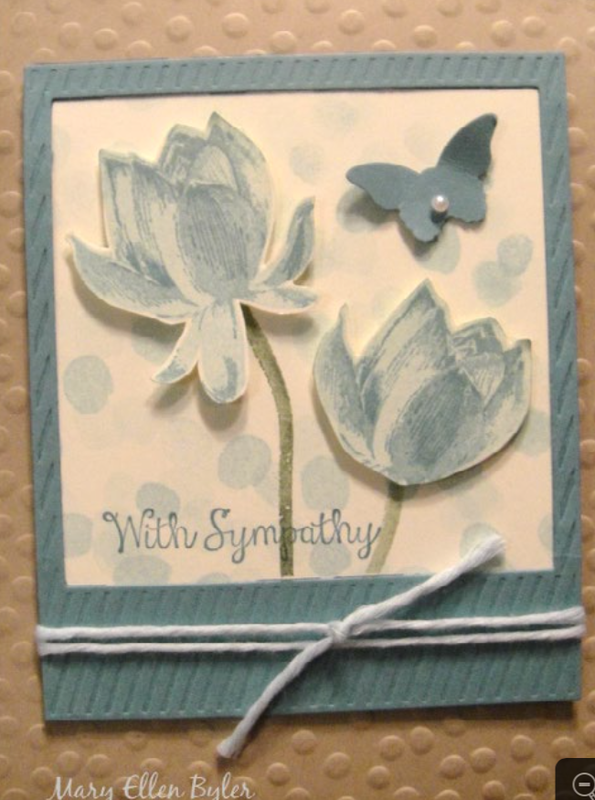 How can Stampin’ Up! make the current Sale-a-Bration promotion even better? By adding four new products that you can earn for free! From March 1-31, with every $50 spent pre-tax and shipping, you can choose one item of your choice for FREE from the current Sale-a-Bration product selection. Four new products have just been added! Two different stamp sets, a set of gorgeous vellum papers, and a set of accessories- ribbons & buttons- in the ‘In Color’ color scheme. Click here to see more detailed images of the four new products, and click here to see the other Sale-A-Bration products being offered. You can also earn these extra freebies by hosting a get-together with your family and friends. Online or in-person, you and your friends can get together and make a card, Project Life page, or other item, and you earn free and half-price items based on product sales. Contact me to place an order, or with any questions! 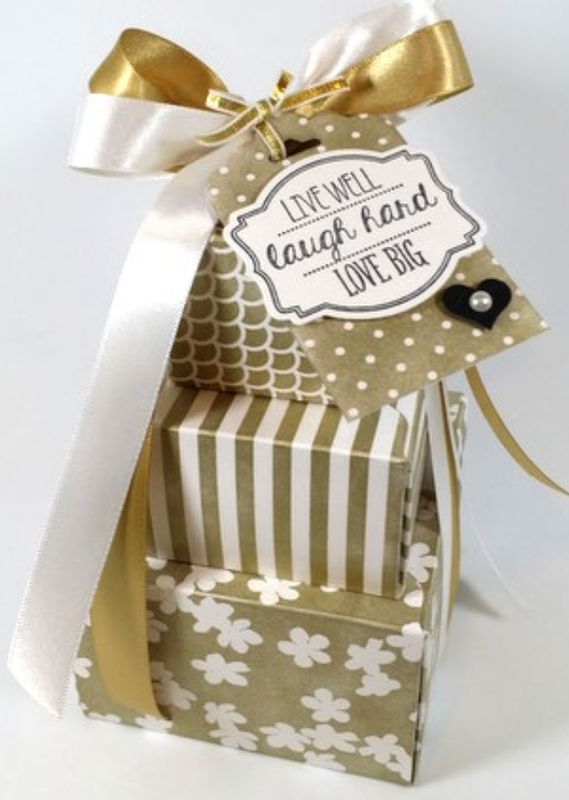 This post is featuring the “Irresistibly Yours” specialty designer series paper. Available only through the Sale-A-Bration brochure, this special 12×12 paper is acid & lignin free for safe memory keeping. It has a unique white paper with different glossy white patterns, designed to allow you to color the paper using a variety of different techniques. As you add color, the pattern will become more and more revealed. 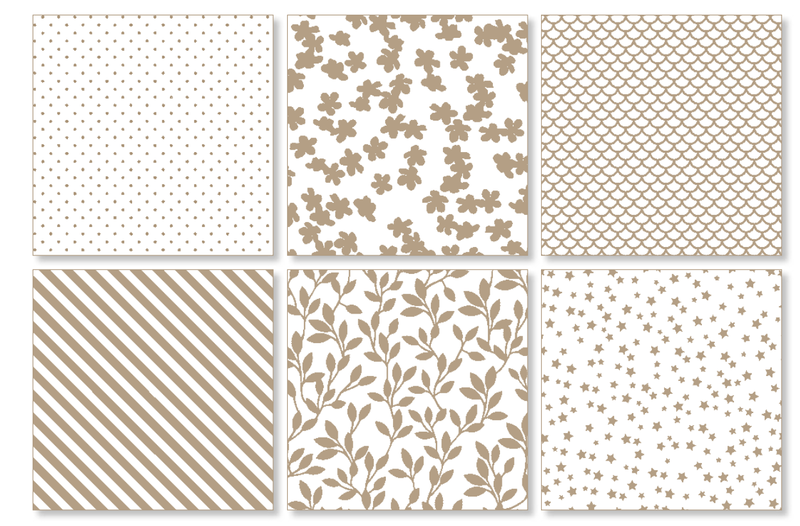 Here is the different designs you’ll receive, 2 of each for 12 sheets total, 12×12 size. The brown shade shown here is to show the different patterns clearly. Now here are three different examples of using this paper, and you’ll notice how very different from each other they are, just by using different colors and coloring techniques. I’d be happy to teach you the different techniques used here, and recommend the best inks, markers, and tools to achieve the effect you’re looking for. You can earn this paper set for FREE between now and March 31st when you purchase $50 or more (pre-tax & shipping). If this isn’t your cup of tea, I’m sure there’s something that will catch your eye in the Sale-A-Bration brochure. Contact me with any questions or to place an order, I’d love to help! 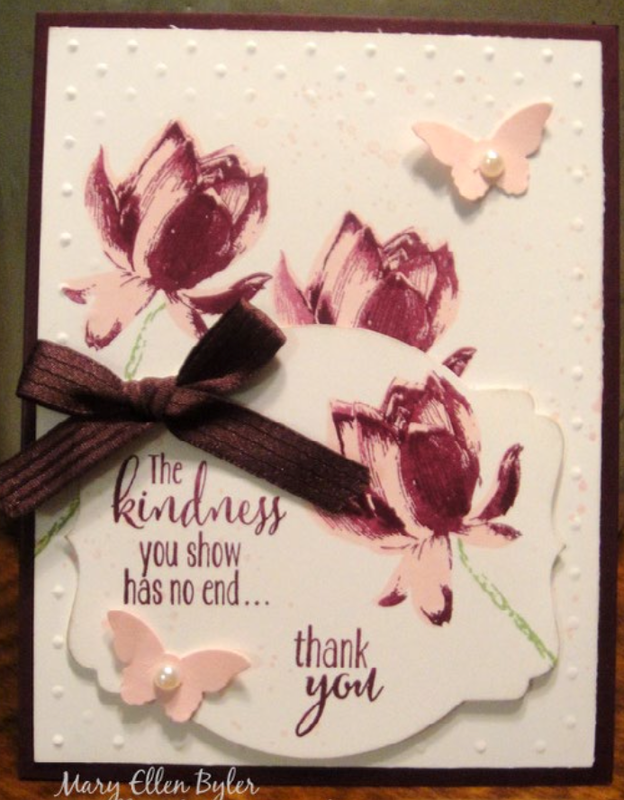 The lovely Lotus Blossom stamp set is just one of the products you can earn free during Sale-A-Bration. This set of 7 photopolymer stamps makes anyone feel like an artist in three quick steps. It creates a beautiful flower that looks painted, but it is amazingly easy. The individual stamps have a tab at the top to help you align them, and the tabs are numbered so you will know which part of the flower to stamp first, second, and third. 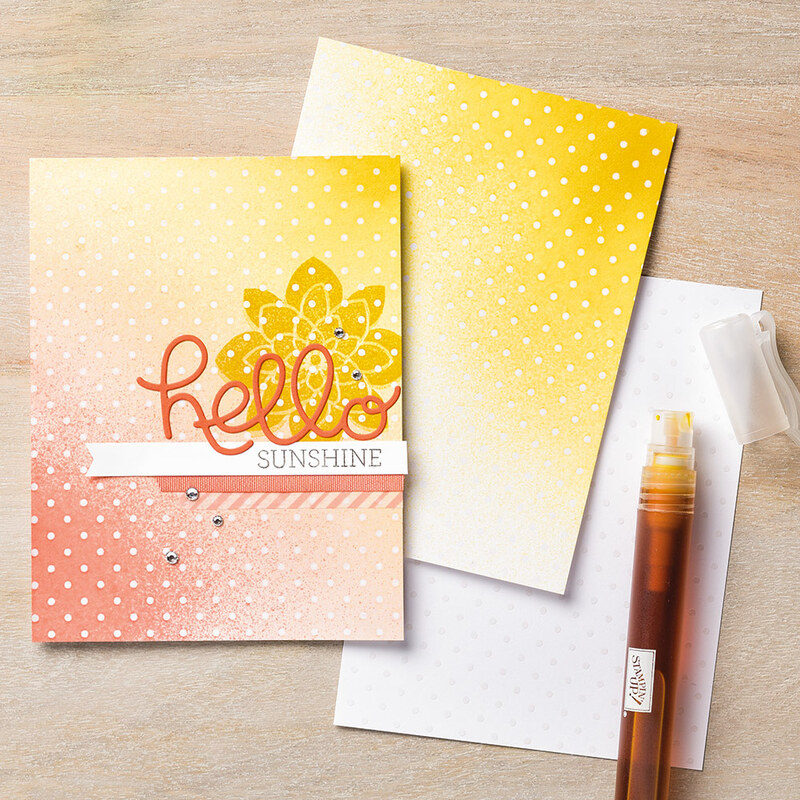 Try playing around using one ink pad with the stamping off technique, or multiple different ink pads to create many different looks. 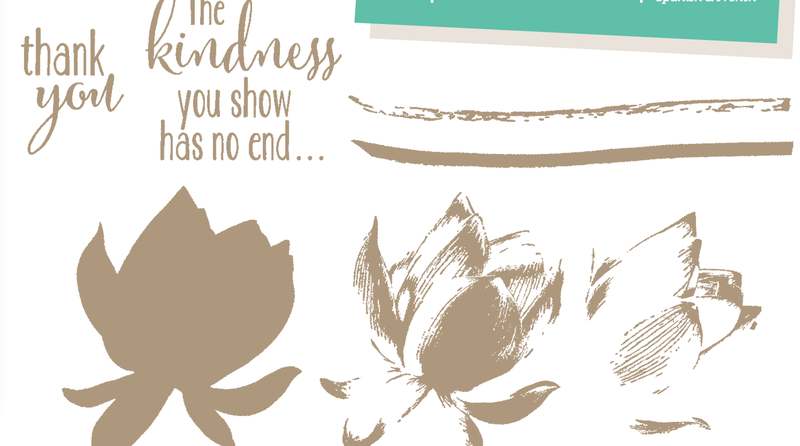 Remember, you can earn this Lotus Blossom stamp set or any item of your choice from the Sale-A-Bration catalog with your $50 purchase (pre-tax & shipping) now through March 31st. 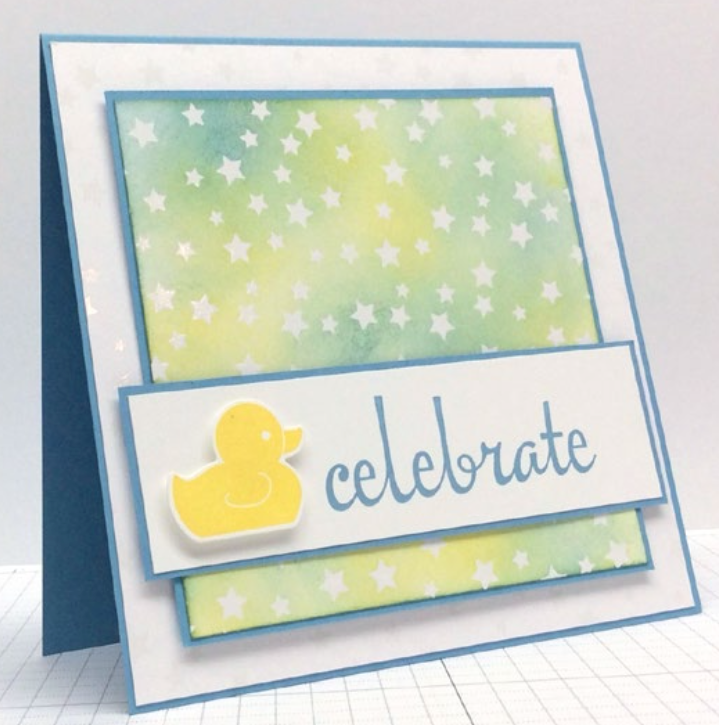 Over the next few days and weeks I’ll be sharing more featured products from the Sale-A-Bration brochure with pictures and ideas of how to use them. Please don’t hesitate to contact me with any questions, or to place an order. The January Paper Pumpkin kit did not disappoint! It came with all the supplies needed to make 24 of the treat bags you see pictured. 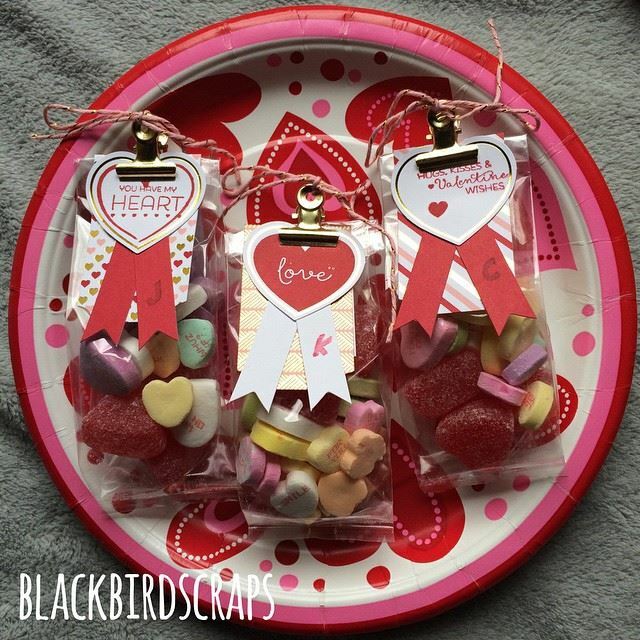 Bags, pre-punched tags, pennants and hearts, gold clips, pink & gold baker’s twine, even adhesive and of course an adorable exclusive photopolymer stamp set and a “really read” ink spot that I’ll be able to use over and over for future projects. I’m working on some alternate ideas for this kit, as I don’t think I want to make all 24 bags, and I’ll update this post as that happens. Paper Pumpkin really is an awesome deal, and just plain fun. Kits that are appropriate to the season come right to your door including full instructions and everything you need to complete the project (sometimes you might want to add adhesive, and you’ll want scissors but that’s about it). The high quality photopolymer stamps that come in each kit are exclusive to Paper Pumpkin and can’t be purchased any other way. You’ll also get a mini stamp pad, called an ink spot- and the colors of ink are guaranteed to not repeat in a calendar year, so it’s a fantastic way to build your stash of ink colors. If you’ve been thinking about trying Paper Pumpkin, this is a great time to do so, as we are in the middle of Sale-A-Bration through March 31st. That means that for every $50 you spend (pre-tax and shipping) you can choose an item of your choice from the Sale-A-Bration brochure. These are also exclusive products and can’t be purchased, only earned through Sale-A-Bration. The three-month pre-paid subscription is currently on sale, and it is enough for you to earn a free Sale-A-Bration product! 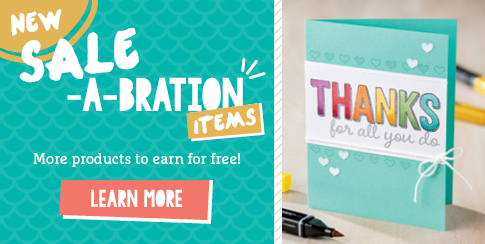 The six month is enough for you to earn two Sale-A-Bration products, and the big daddy 12 month pre-paid subscription will earn you THREE Sale-A-Bration products of your choice, PLUS $30 additional credit to spend on anything in the current Stampin’ Up! catalog…and if you’ve taken the plunge that far, I’d really recommend adding $34.60 worth of any Stampin’ Up! products to your order of the 12-month prepaid subscription, and for good reason. If your order totals $250, which it would in the scenario I just gave you, you will earn a total of FIVE Sale-A-Bration products of your choice, PLUS $65 credit to buy anything currently sold by Stampin’ Up! 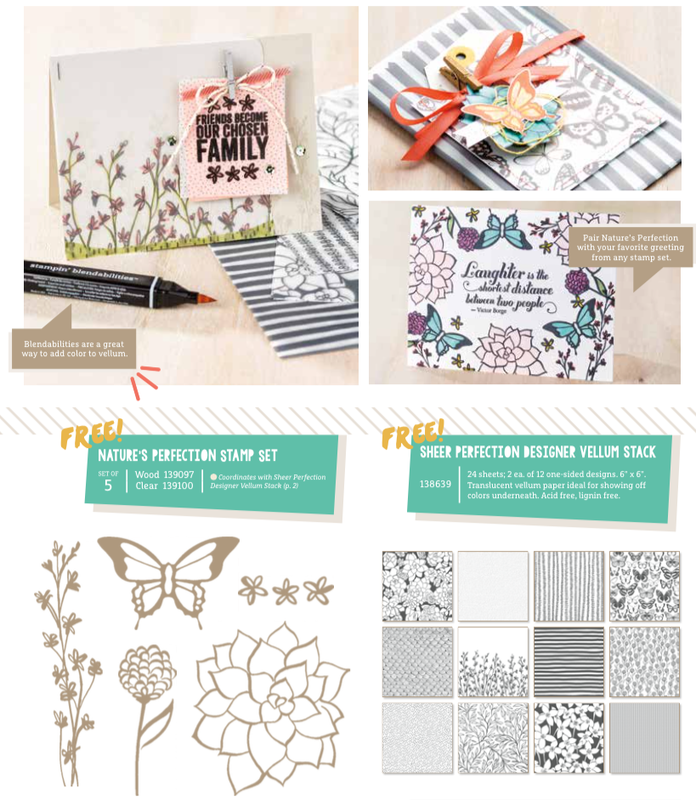 Think about that…approximately $140 worth of free products that you choose, delivered to you right away, and then the excitement of a new Paper Pumpkin kit coming to you each month to keep you paper crafting all through the year. I don’t deny it’s an investment of $250, but you’re getting close to $380 worth of product for that investment! What kind of free products are in the Sale-A-Bration catalog? I assure you, nothing cheap or chintzy, but high quality Stampin’ Up! goodies. You can view the brochure by clicking here, but some of the products include: several stamp sets -in your choice of clear, wood (and photopolymer in some cases) with no uncharge for wood, an exclusive Project Life mini kit, a set of three Blendabilites markers in a variety of colors, designer series paper, embellishment kits. No matter what type of paper crafter you are, be it a card maker, a scrapbooker, beginner or advanced there is something for you here.